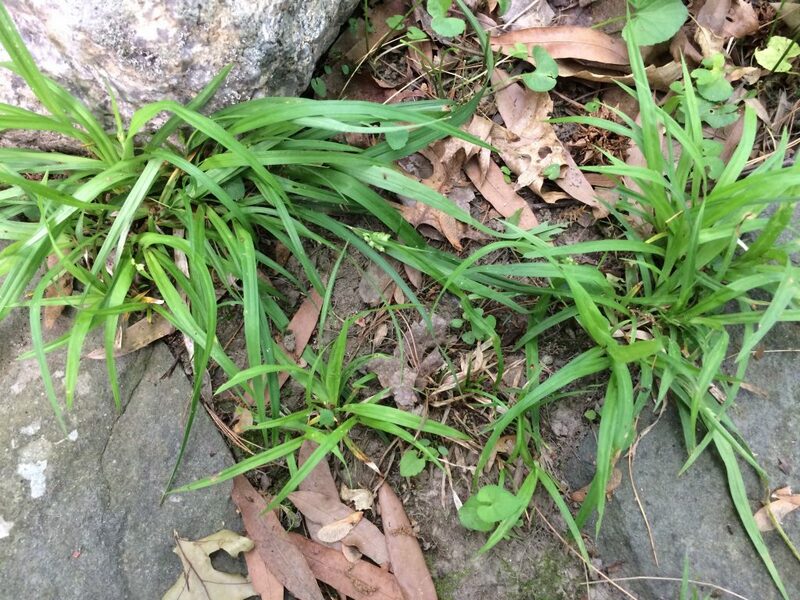 Carex abscondita is a small perennial sedge, in low tufts of wide leaves, shade tolerant, winter-green, fertile stems 5-25 cm, mostly hidden in leaves. Carex abscondita inflorescences.Gary P. Fleming.Virginia Department of Conservation and Recreation.www.dcr.virginia.gov (Accessed 12/2014). Flower spikes 2-3, upper ones almost stalkess, lowermost base of inflorescence, much shorter than leaves, delicate, often hidden by foliage; terminal spike male (bearing only anthers) about 1 cm long, often hidden by bracts of fertile (female) spikes, perigynium beakless, 3-sided, finely veined (use lens), achenes 3-sided, style deciduous; blooming and fruiting May-July. Habitat: Understory of moist to wet forest, soil pH 4.8-6.8; tolerant of shade, anaerobic soil and fire, intolerant of drought, salt (USDA, NRCS 2010). 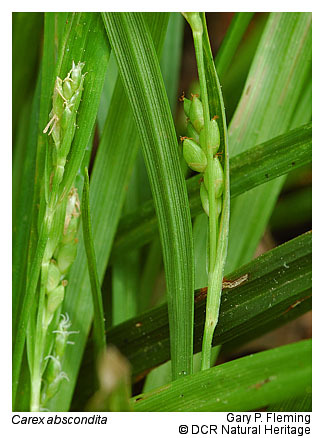 ← Carex Genus sedges Cyperaceae (Flora of North America Editorial Committee 1993+).